The 1970s-era environmental phrase “Think globally, act locally,” is an apt way for data center operators to consider the best approach to understand and address the effects of climate change on their facilities and IT operations TODAY. Globally, we all hear that climate change threatens to bring warmer temperatures, stronger storms, rising sea levels, and more rain. It’s not too much of a stretch to agree that at the local level, this can mean increased flooding and droughts associated with higher ambient temperatures and winds, stronger lightning, and more humidity. So it’s not hard to understand that these changes are already posing significant implications for public infrastructures and real estate ventures, as well as their digital constituents including the delivery of IT services. Uptime Institute advises data center operators and owners to evaluate their facilities and procedures considering the growing threat, and where possible, act to mitigate the risk from these environmental changes which will potentially impact their physical infrastructure along with their operational best practices currently in place. To get started, data center operators should strive to create a baseline of service resiliency with climate change in mind. Many facilities have been designed to meet the level of flooding, storm, drought, or fire events as they were understood years ago. These facilities also may have adequate capacity to meet some amount of increased cooling demands from higher ambient temperatures, but the specific additional capacity may not be well understood relative to the needs brought about through climate change. Resiliency assessments could reveal greater-than-expected vulnerabilities. For example, the operator of a 20-year-old data center originally built to withstand a 100-year storm as defined in the year 2000 may no longer withstand the greater flooding predicted to occur as part of a 100-year storm defined in 2020. For example, in Houston, TX, 19.5 inches of rain defined a 100-year storm as recently as 2000. Today, that same amount of rainfall is a 17.5-year event. By 2100, it is expected to be a 5.5-year event. As a corollary, 100-year events in the near future will involve far greater rainfall and flooding than we expect today. This evolving threat means that data centers slowly become less resilient and then suddenly are vulnerable, if planning and mitigation are not part of an ongoing planned process. There are no shortcuts to these investigations. Moving to a hosting facility, does not necessarily lower an organization’s risk. Hosting facilities can also be just as vulnerable to a wide range of climate change impacts, and these providers must be subject to due diligence before hosting contracts are signed, just as in any other site evaluation process. And the questions which are part of due diligence should be more forward looking with climate change level stress provisions identified. According to Uptime Institute’s 2018 survey, many hosting providers are taking climate change very seriously. The survey found that hosting providers are far more likely than any other vertical to have considered or taken a variety of climate change precautions than any other sector. As the chart below indicates, hosting providers (81%) were far more likely to say they were preparing for climate change than any other sector (industry average, 45%). They were also far more willing to re-evaluate technology selection. Data center operators have many other operational issues to consider as well. Hardening the physical facility infrastructure is a good first step, but data center operators must also re-examine their MOPs, SOPs, and EOPs, as well as their supporting vendors’ SLAs. One good example of proper planning is when a major brokerage in New York City, during Superstorm Sandy, remained 100% operational because it had developed and followed suitable procedures and best practices for addressing conditions proactively. Uptime Institute found that many firms like this that switched to generator power in advance of an expected utility outage remained operational through the storm and continued to successfully operate if supply procedures were in place to guarantee on-going fuel availability. In addition, these firms provided provisions for local operational staff whose homes and families were threatened by the storm. But data centers do not work as islands. A data center encircled by water, even if operational, cannot support the business if it loses local network connectivity. Likewise, flooded roadways and tunnels can interrupt fuel oil deliveries and block staff access. The extent of these threats cannot be fully evaluated without including an extensive list of local conditions ranging from town and village highway closure reports to statewide emergency services response plans as well as those plans from all telecommunications providers and other utilities. These services each have their own disaster recovery plans. The incremental nature of climate change means that resiliency assessments cannot be one-time events. Data center resiliency in the face of climate change must be re-assessed often enough to keep pace with changing weather patterns, updated local and state disaster planning, and telecommunications and local infrastructure. Finally, data center operators must keep abreast of a laundry list of costs expected to rise as a result of climate change. For example, insurance companies have already begun to increase premiums because of unexpected losses due to unprecedented and anomalous events. In the same way, resources such as water are expected to be increasingly expensive because of shortages and local restrictions. Utilities and suppliers could also be affected by these rising costs, which are likely to cause the prices of diesel fuel and electricity to increase. Now is the time to evaluate climate change threats on a local basis, facility by facility. 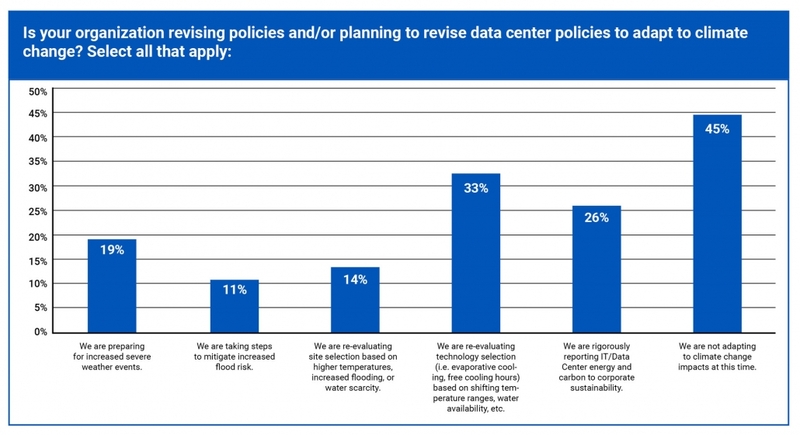 Data center operators have this obligation to fully understand how climate change affects their facilities and their customers. They may find that a mix of solutions will be adequate to address their needs today, while other more radical solutions are needed for tomorrow. Climate change, or whatever you wish to call it, is here… now.